While we made Mao's Red-Braised Pork as is from Fuchsia Dunlop's recipe (in Revolutionary Chinese Cookbook: Recipes from Hunan Province ), we were also very intrigued by the numerous variations she had listed at the end of the recipe. We thought we'd make a variation of the dish with the leftovers -- of which there were barely any. 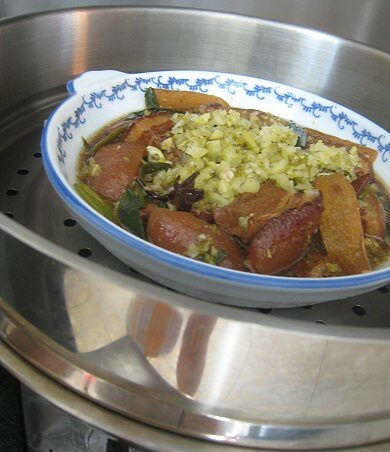 There was Red-Braised Pork with Water Chestnuts and Red-Braised Pork with Garlic Cloves. I love the crunch of water chestnuts, and I am a garlic fiend. But, both these versions require deep-frying. Too lazy to do that. There was also Red-Braised Pork with "Tea-Tree" Mushrooms. I thought this referred to black cloud ear mushrooms, which I really like. But, it turns out, "tea-tree" mushrooms are something completely different. I don't even know if those are available here. Finally, I spotted something extremely easy to do. 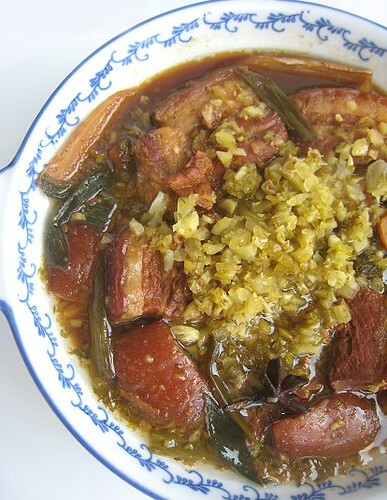 Plus, we already had the required ingredient at home: Steamed Red-Braised Pork with Preserved Mustard Greens 酸菜蒸紅燒肉. Well, actually, what we had at home was suan cai of the Taiwanese sort; the kind prevalent on top of Taiwan Beef Noodle Soups. 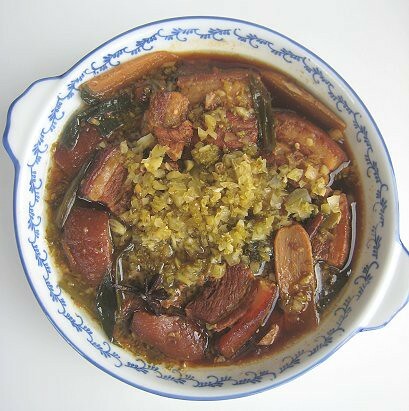 This suan cai is made by simply putting mustard greens into a jar and adding a little vinegar, a little salt and a little sugar. 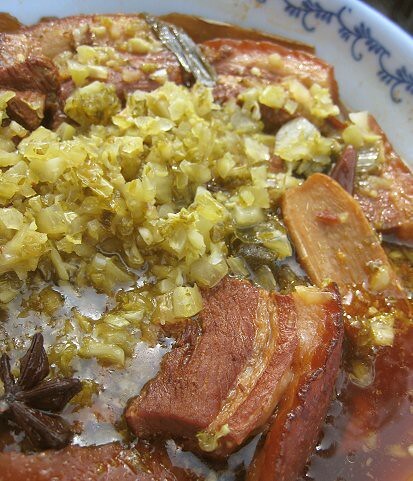 The suan cai Fuchsia Dunlop refers to are what she calls "preserved mustard greens." These are actually dried and salted mustard greens that are left to ferment in clay jars. She mentions that Tianjin Preserved Vegetable are made in the same manner. So, this dish may not be what Fuchsia (first name basis) meant, but I'm going with it. 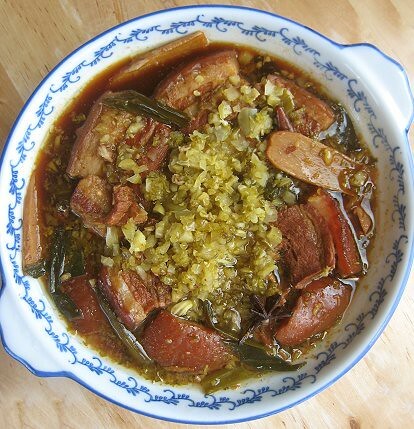 Simply place your leftover red-braised pork, if there is any, in a dish and add the suan cai. Steam away! Actually, one could just pop the whole thing in the microwave to make the whole process easier. As mentioned in our previous post, I surprised myself by how much I loved the Mao's red-braised pork belly. I thought I had foresworn all "Chinese adobos," preferring the Filipino adobo instead. In my head and my prejudice, all Chinese adobos tasted like sweet-ish soy sauce, but this version confounded me. It didn't taste cloyingly sweet-ish and it didn't taste very soy-saucy at all! The dish just seemed to me to be the highest apotheosis of pork, pork transcendent. By the way, I did like the steamed version with the pickled mustard greens, but probably not as much as I liked its mother. It's the first-time we've "red-braised" using that caramel method. We'll be doing that more often!